The Patient Centered Medical Home (PCMH) is a model of primary care delivery designed to strengthen the patient-clinician relationship by replacing episodic care with coordinated care and a long‐term healing relationship. It can lower costs of care through its focus on patient self-management and engagement, rather than only disease treatment. PCMH encourages teamwork and coordination among clinicians and support staff to give patients' better access to care and to take a greater role in making care decisions. Key PCMH components include understanding patients’ preferences and culture, shared decision making between patient and clinician, and patients’ willingness to establish and work toward personal health goals. 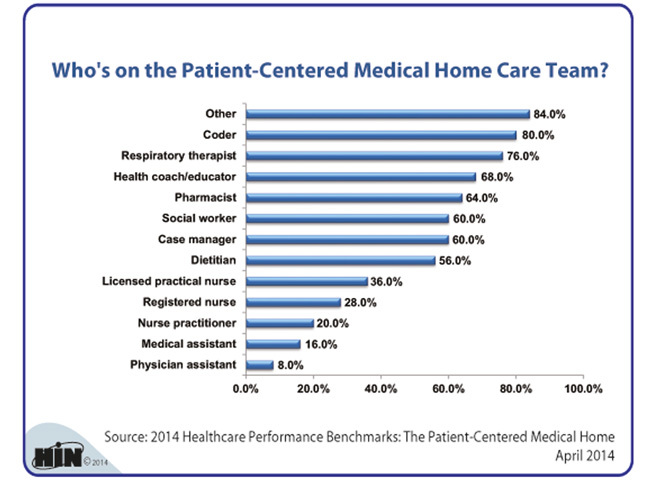 The following chart by Healthcare Intelligence Network spells out who is on today's Patient-Centered Medical Home care team. Having established a firm foundation over two decades of patient-centered care, the patient-centered medical home (PCMH) model is poised of renovation, expanding into medical neighborhoods and opening the door to specialists' enhanced role in care coordination. This infographic, created by Healthcare Intelligence Network, presents 10 metrics documented by HIN's seventh PCMH survey in March 2014, including the rise in medical homes, involvement of remote care management and case management, biggest challenges, future outlooks and more. What is a Patient Centered Medical Home and What are the Benefits? The Patient Protection and Affordable Care Act (PPACA) of 2010 calls for improvements in health care delivery that will increase quality outcomes and access for patients, and simultaneously reduce costs. For years, physician and hospital associations, as well as independent and governmental watchdog groups, have been concerned about the growing complexity of health care in the U.S. and its effect on the provider and the patient. The Institute of Medicine’s 2001 Report: Crossing the Quality Chasm called for sweeping change, saying, “today is characterized by more to know, more to do, more to manage, more to watch, and more people involved than ever before.” Healthcare is currently fragmented and therefore inefficient and often ineffective. The American Academy of Pediatrics (AAP) had the same concerns 35 years ago when it introduced the concept of a “medical home”. The objective at that time was to foster development of a centralized archive of a child’s medical records enabling one, centralized team to orchestrate the care of that child. Building further on the concept, the AAP expanded the model in 2002 to focus on the medical home as a means of improving access and enhancing communication among members of the health care team to ensure a lifetime coordination of care for patients. In 2007, the American Academy of Family Physicians, The American College of Physicians and the American Osteopathic Association joined the AAP in endorsing the Joint Principles of the Patient-Centered Medical Home. Comprehensive—a team, led by the patient’s personal physician, is accountable for responding to the majority of the patient’s physical and mental health needs across the continuum of prevention and wellness, acute and chronic care. Patient-centered—the emphasis is on the needs of the patient rather than the convenience of the health care provider team. The team takes into account all the aspects of life that affect one’s health, including things like the patient’s social environment, economic means and transportation challenges. The PCMH promotes patient empowerment to manage their own condition rather than fostering dependence on the health care team. Coordinated—this requires coordination of care amongst all health providers involved in the care of the patient, across various specialties and facilities. This requires clear, open and timely communication, and optimally, the use of electronic health records. The PCMH team takes responsibility for coordinating care between transition points. Accessible—this calls for shorter wait times for office appointments, expanded office hours, and 24-hour access to the team for advice by phone or other forms of electronic communication. It means being available when the patient perceives need. Safe and of High Quality—this requires use of evidence-based clinical guidelines and decision-support tools that allow for shared decision making with patients and families. This also requires engaging in performance measurement and improvement, practicing proactive population health management and measuring, and responding to, concerns of patient satisfaction. Statistics show that higher spending on health care in the United States has not equated to higher quality outcomes. Americans are aging and, according to the Centers for Disease Control, half the population is living with some form of chronic illness. Numerous physician groups and health care organizations have undertaken pilot projects to investigate whether the PCMH model can address costs and improve the patient experience. The Patient-Centered Primary Care Collaborative, representing more than 1,000 medical home stakeholders and supporters throughout the U.S, conducted a 2012 review of 46 medical home initiatives throughout the United States. Results confirm that the medical home model reduces overall costs by reducing inpatient care, emergency department use, hospital readmissions, and other expenses. Duplicate testing, unnecessary procedures and redundant prescriptions can be eliminated as well, as care is tracked by the PCMH team, which holds itself accountable for the overall well-being of its patients. According to the Patient-Centered Primary Care Collaborative, PCMH patients are more likely to seek “the right care in the right place at the right time” Better management of chronic illness improves outcomes, and a focus on wellness/prevention reduces the incidence of such illness. Beyond cost savings, a PCMH environment promotes division of duties through a team model of care that enables the physician to maximize their meaningful interaction with patients and spend less time on activities that should be done by others. This helps preserve primary care physicians, who are in danger of going “extinct” due to the pressures of traditional models of care. Patients also report higher satisfaction in a PCMH, due to better access and care coordination and an overall feeling that they are being looked after proactively. PCMH is a comprehensive response to health care reform. There is broad support among public and private sector payers to reward patient-centered medical homes, due to the efficiencies they create to decrease the overall cost of care. According to the National Academy for State Health Policy, Medicaid payments to medical homes are underway in Illinois, but the transformation required for a practice to become a PCMH can actually serve providers in the present fee-for-service model as well, as access and efficiency increase. Many groups are also finding that developing a PCMH model helps them to comply with the Centers for Medicare and Medicaid Services (CMS) Physician Quality Reporting System (PQRS) and electronic health record Meaningful Use incentive program. Implementing a PCMH approach within a health system helps to standardize its best practices, especially those related to access, quality and safety. PCMH also provides an exceptional framework for clinically integrated networks (CINs) and accountable care organizations (ACOs). Cost savings, time savings, potentially enhanced reimbursement, increased patient satisfaction; improved health quality outcomes and provider satisfaction are all potential benefits of adopting a PCMH model. Several organizations officially “recognize” practices that demonstrate transformative effects that live up to the Joint Principles of PCMH discussed above. This recognition entitles these practices for enhanced reimbursement in many communities. There are more than 6,037 PCMH sites in the United States, according to the NCQA. To further reduce fragmented care, many PCMHs are expanding to house the entire care continuum – a phenomenon known as the Medical Neighborhood. Medical home neighbors include specialists along with primary care clinicians to better coordinate care, according to a new infographic created by the Healthcare Intelligence Network. This infographic includes successful tactics for medical home 'neighbors,' signs of a desirable medical neighborhood and medical home neighborhood advice and comments from actual healthcare organizations. Electronic Health Record adoption has passed 50% in the United States--with some states deserving more credit than others (Wisconsin, Minnesota, North Dakota). The numbers clearly vary drastically throughout the US--and not every doctor with an EHR is using the system to e-prescribe. This infographic put together by Health Biz Decoded breaks down which states have the highest EHR and E-Prescribing rates, and which have some catching up to do. A patient-centered medical home (PCMH) program operated by Blue Cross Blue Shield of Michigan has saved an estimated $155 million in prevented claims over its first three years through June 2011. The savings were based on calculations made from an analysis published this month in the Health Services Research Journal, according to a Michigan Blues’ news release issued on July 8. The estimate was certified through the Blues' actuary. Blue Cross Blue Shield of Michigan and University of Michigan researchers found that its PCMH model, when fully established, yielded a 3.5% higher quality measure, a 5.1% higher preventive care measure, and a $26.37 lower per member per month medical cost for adults. Those avoided costs represent savings gained relatively early in the program's history and factor in costs at all practices in the program, not just those that had been designated as PCMH-based practices, the report noted. Cost savings realized by highly developed PCMH-based practices are substantially greater, with the Michigan Blues estimating that they may have saved an additional $155 million in the program's fourth year. Although transformation to a full PCMH model often takes many years, the analysis found that even partial, incremental implementation of PCMH functions was associated with preventive care, quality improvements and cost savings. “In our analysis, we found that newly implemented parts of the PCMH model were associated with better preventive care and quality-of-care outcomes similar to previously established parts of the PCMH model,” said Michael Paustian, lead author and manager in the department of Clinical Epidemiology and Biostatistics at Blue Cross Blue Shield of Michigan. “But the cost benefits appear to be greater for parts of the PCMH model that have been in place for over a year compared to the newly implemented parts, suggesting that it may take time for these processes to fully mature,” Paustian continued. “This tells us that patients benefit from higher quality and improved preventive care even as physician practices are progressing toward full implementation of the PCMH model,” he noted. Blue Cross Blue Shield of Michigan began working with physicians across Michigan in 2005 to test which features and capabilities should be included in a PCMH model. Physician practices began earning the PCMH designation in 2009. Those practices earning designation were found to have made the most progress in transforming their processes, staff and procedures into the PCMH care model. For example, PCMH practices offer 24-hour access to the care team and coordinate specialist and other care, such as nutrition counseling. PCMH practices also track patient conditions, such as asthma and diabetes, teach patients how to manage those conditions, and connect patients to community services when needed. The research was funded by the national Agency for Healthcare Research and Quality. Providers looking for ways to improve patient outcomes and raise the quality of their care are turning to accountable care organizations (ACOs) and patient-centered medical homes (PCMH) at a rapid rate, according to a new survey by eClinicalWorks. Electronic health records are the engine behind the shift towards more collaborative, patient-centric care, allowing better data analytics, alerts for high-risk patients, and tracking of quality and patient outcomes, which is a major challenge for providers embracing risk-based reimbursements. The survey of more than 2,000 clinical practitioners and practice administrators showed that providers are increasingly interested in ACO and PCMH models to increase their market share, use resources effectively, and better treat their patients. Over half of the providers surveyed already participate in a risk-based or shared savings organization, while another third anticipate joining or creating a collaborative within the next three years. Two-thirds of participants believe that ACOs and PCMHs effectively improve patient outcomes, while 41% think the business structures make a better use of financial resources, while 39% appreciate the shared savings. However, many providers who are not part of an ACO or PCMH are waiting to see exactly how much those benefits total up before committing to the switch. One quarter of participants are watching to see how their peers benefit from the accreditation, while 14% are unsure if they will see a return on investment in their own practices. A relatively small number, only one in ten, believe that the necessary changes are simply too significant to seriously pursue. The remaining respondents weren’t sure why their might not pursue an ACO or PCMH designation, but have no plans at the moment to do so. One of the challenges that may deter some providers is the burden of reporting quality data to maintain compliance. Three quarters of ACO participants cited tracking and monitoring of quality outcomes as their primary struggle, while a similar number said that care coordination for patients across multiple providers also presented difficulty. In a nod to the efficiency of EHRs and practice management software, which 95% of providers think is the key to ACO and PCMH participation, only 30% of respondents said that it was challenging to get their IT systems to produce the necessary reports. Providers praised the ability of EHR software to produce useful alerts for high-risk patients, with 75% rating the feature as “very important” to their daily work. Care planning and coordination tools were also popular. Patient engagement extras, like online portals, smartphone apps, and patient-facing notifications and surveys, were also important to providers. Other systems such as case management capabilities, standard reporting formats for quality measures, and cost and utilization analytics rounded out the must-haves for ACOs and PCMHs, with more than 90% of survey respondents rating each of them as very important. While accountable care organizations are still relatively new, and many providers have adopted a wait-and-see attitude when it comes to shouldering more financial risk in an industry already in flux, ACOs and patient-centered medical homes are increasingly successful as EHRs take root in the majority of provider offices. With the proliferation of better reporting tools and a pervasive emphasis on quality care and cost reductions, ACOs and PCMHs will only become more popular as the focus on coordinated care and patient engagement continues to grow. The goal of a patient-centered medical home (PCMH) is to deliver greater coordination of care through provider teamwork, patient communication, care management, and technology. Mounting evidence shows the PCMH model improves care outcomes and reduces costs. Yet most medical groups are reluctant to adopt this approach. The barrier is money. Although funding opportunities are expanding, most payers do not offer additional dollars for medical home care. A PCMH represents additional operating expenses with little or no increase in operating revenue. Given financial realities, does it make sense to adopt the medical home model now? A growing number of medical group leaders think it is. First, the immediate benefits are real. Pilot programs across the country show that medical homes improve access to care, help ensure patients receive optimal care, and reduce utilization of high-cost resources. Second, the medical home model is a comprehensive response to healthcare reform. Many groups fi nd that a PCMH consolidates compliance with several programs—including the Centers for Medicare and Medicaid Services (CMS) Physician Quality Reporting System (PQRS) and electronic health record (EHR) incentive programs (Meaningful Use). A PCMH also supports participation in clinical integration initiatives and accountable care organizations (ACOs). In addition, the model can help groups prepare for future reform initiatives since it aligns with the “Triple Aim” of improving patient care, improving population health, and reducing healthcare costs. Third, the medical home model provides a clear plan of action. Unlike many recent initiatives, the PCMH model developed by the National Committee for Quality Assurance (NCQA) provides a straightforward platform of standards, performance factors, and scoring. Well-defined medical home certification platforms have also been developed by the Utilization Review Accreditation Commission (URAC), Accreditation Association for Ambulatory Health Care (AAAHC), and the Joint Commission (JCAHO). Groups that are reluctant to pour resources into a vague strategy are embracing PCMH. The NCQA medical home recognition program is for primary care physicians (a specialist program is in development). Successful early adopters have used a systematic approach to achieving NCQA recognition. The key is to develop a step-by-step plan for transforming the way your group delivers patient care. To read the full article, plase click the button, below, for instant PDF access.